Shippers everywhere are feeling the pressure to increase their products' speed to market. In a world where consumers have become used to expedited shipping and new items on store shelves every week a higher speed to market can be a great competitive advantage. That competitive advantage begins with having greater efficiency within the supply chain, but if you're like most of the shippers polled by Sourcing Journal in the report Digital Aspirations, Blind Spots & the Transparency Divide then you may not be sure where to start. 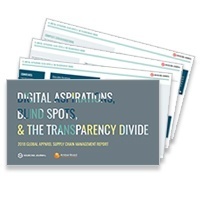 Digital Aspirations, Blind Spots & the Transparency Divide explores the digital and transparency divide that plagues today's shippers with many reporting they still rely on outdated manual processes to manage their supply chains. This report has found that greatest differentiator between companies that are thriving in today's market and companies still struggling to catch up with consumer expectations is a digital solution. See how your company's processes compare and discover how you can increase efficiency throughout your supply chain - download the report today!